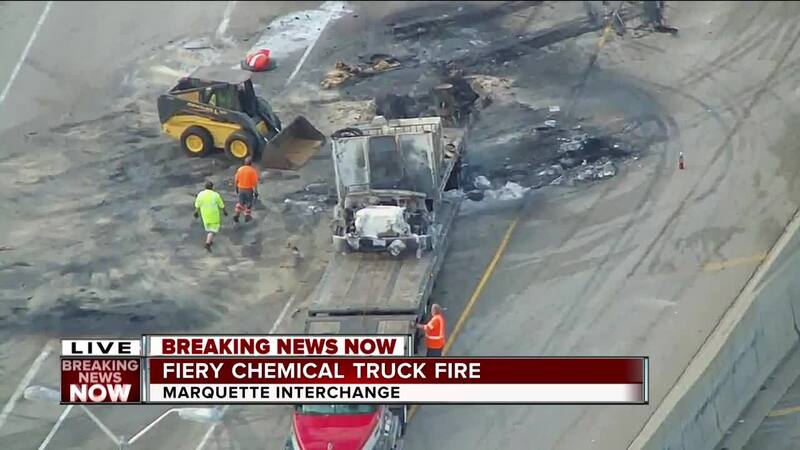 MILWAUKEE – No injuries have been reported after a car crashed into the back of a construction truck early Tuesday morning and burst into flames. The crash happened on northbound I-43/94 at National Avenue -- just after 3 a.m. -- and forced the Marquette Interchange to completely close. Video shows the truck fully engulfed in flames just after the crash. Explosions can be seen during the fire which caught one witness's attention. "When I seen the fire explode, I thought it was the bridge," Tyrone Keith, a witness said. 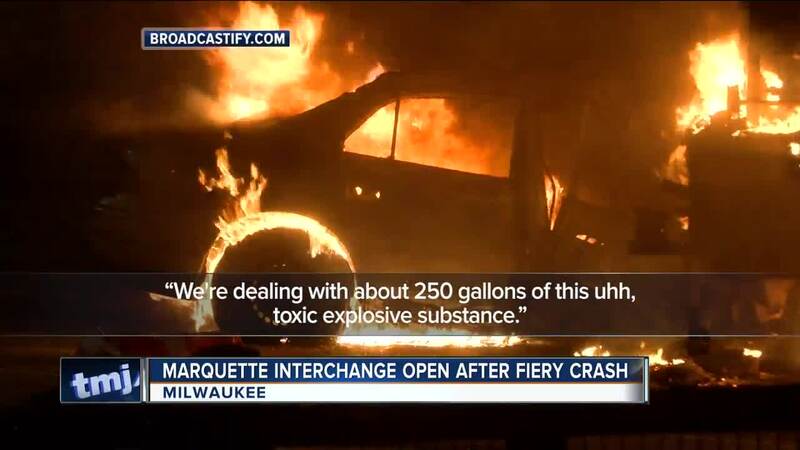 "I never seen a big fire like that here in Milwaukee yet. That was one of the biggest ones." For how large the fire was, things could have been much worse. The driver of the car was able to get out of his car safely and did not need any medical treatment. Initially, firefighters were told a hazardous chemical was on the truck. Trucks carrying chemicals have a placard on the side or back of the vehicles with a number explaining what is inside. The number firefighters were told was associated with a toxic and possibly explosive chemical. "It presented a number of challenges as far as us applying water to that fire," Chief Aaron Lipski with the Milwaukee Fire Department said. "We immediately pulled back and got a Hazmat team on site." However, after communication with the construction foreman, they confirmed the chemical on board was a primer used on roads. "They have a number of vehicles they travel with," Lipski said. "There was a little confusion for which vehicle was hit. The items carried on this other trailer were far less hazardous, far less explosive, far less potential negative impact to the environment. So that was good news. We de-escalated." Crews were close to starting evacuation efforts for the surrounding densely populated area, which includes a Marquette dormitory. "We don't like to pull this trigger," Lipski said. "We don't take it lightly. There's no joy in it. There is a little less joy in leaving firefighters and sheriff's deputies and civilians in too close proximity and now we have a massive explosion that we could have prevented all the death and injury that came. An abundance of caution." The crash forced law enforcement to close the entire Marquette Interchange for roughly two hours. The northbound lanes of I-43/94 reopened around 9:15 a.m.